A red-tailed Nile catfish has no real enemies, besides human beings. The largest of all aquarium catfish, the red-tailed Nile dominates aquariums with his size and rarely falls prey to other aquarium inhabitants. In the wild, these catfish aren’t so lucky. They are hunted for sport, but rarely for food. 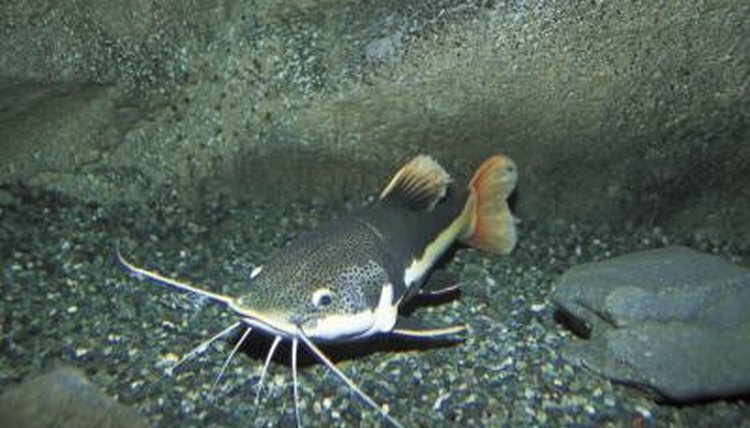 Red-tailed catfish don’t have any natural predators, which is why they flourish in the wild. They make their homes in river beds, such as the ones offered by the River Nile. They’re bottom feeders, camouflaging themselves in the river’s muddy bottom. Their large size is another deterrent for predators -- the largest recorded size of a red-tailed catfish was 53 inches. In Egypt, catfish aren’t eaten because their meat is black, and only white fish meat is regarded as edible. There are similar philosophies in Brazil, another region where red-tailed catfish flourish. In general, red-tailed catfish are only hunted for sport. Sometimes, visitors to these nations will eat the red-tailed catfish they catch, making humans the only creatures that feed on the adults of this species.